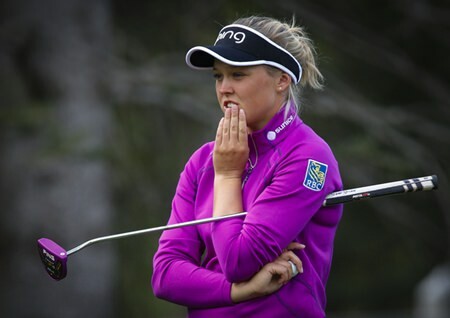 Grand Rapids, Mich. (AP) — Brooke Henderson bogeyed the final two holes for a 4-under 67, leaving the 19-year-old Canadian with a two-stroke lead Friday in the Meijer LPGA Classic. Henderson had seven birdies — four in a row on Nos. 9-12 — and three bogeys to reach 12-under 130 and break the 36-hole record at Blythefield. She had a one-stroke lead Thursday after an opening 63. Her approach on the par-4 17th rolled down a hill and she two-putted. On the par-4 18th, she missed the green, left her chip well short and missed the long par putt. Fellow major champion Lexi Thompson, coming off a playoff loss to Ariya Jutanugarn on Sunday in Canada, followed her opening 64 with a 68 to join 2016 runner-up Carlota Ciganda (64) and Mi Jung Hur (66) at 10 under. Thompson closed with a birdie on 18. Ciganda lost a playoff to Sei Young Kim last year at Blythefield. Henderson won twice last year, taking the KPMG Women’s PGA Championship for her first major, and successfully defending her title in the Cambia Portland Classic. She has a 36-hole lead for the first time since late last September in China in the Reignwood LPGA Classic. Moriya Jutanugarn was 9 under after a 66. Shanshan Feng (70) topped the group at 8 under. The Chinese player is trying to complete a Michigan sweep after winning the LPGA Volvik Championship three weeks ago in Ann Arbor. Ariya Jutanugarn, Moriya Jutanugarn’s younger sister, was tied for 30th at 4 under in her first event as the No. 1 player in the world. Lydia Ko, at No. 2 after an 85-week run at the top, was 6 under after a 71. Michelle Wie also was 6 under after her second 68. Kim had her second 70 to make the cut on the number.